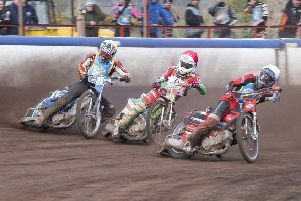 Edinburgh Monarchs’ Premier League speedway clash against Plymouth Devils at Armadale tonight has been postponed due to a waterlogged track. Monarchs now make the long trip to the St Boniface Arena for tomorrow night’s return fixture with the Devils where the weather forecast is a lot more favourable. With Monarchs duo Erik Riss and Max Clegg involved in the first round of the World Under-21 Final at King’s Lynn, the Capital outfit have recruited Michael Palm Toft and Luke Chessell as guest riders. They have also shuffled their riding order in an effort to maximise their line-up. New signing Mark Riss, after a promising debut last week, moves to No.2 to partner skipper Sam Masters while Ryan Fisher slots in at No.4 with Kevin Wolbert dropping down to No.5 where his strong form should help protect Monarchs’ struggling tail-end. Monarchs are currently ninth in the table but just three points adrift of a top six play-off spot with matches in hand. Plymouth are in tenth position.